Ahhhhh Finally | "Endangered Ecosystems - The Virtual Salt Water Marsh"
I have been searching all over for the ideal picture for Salt Marsh Dynamics and here it is! 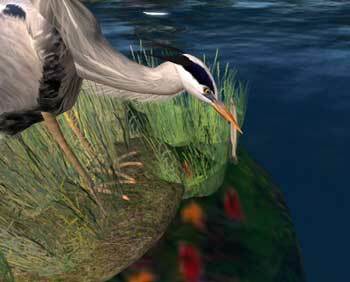 I found this heron in Spellbound Woods, Creative Fantasi in Second Life. The animation is so incredible as the bird fishes for his next meal. ~ by Heidi Trotta on April 11, 2009.